Bringing the Blues back to the Cavern! 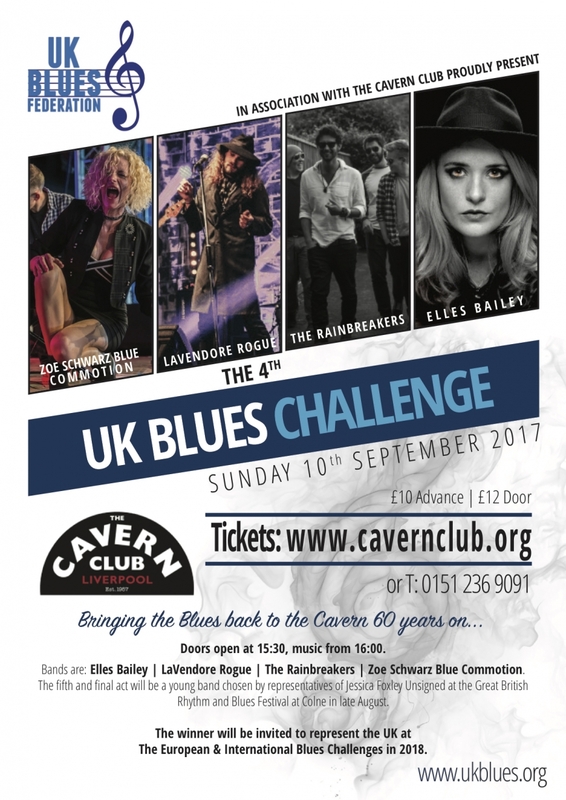 The Cavern is delighted to host the UK Blues Challenge for the first time. As part of our 60th anniversary celebrations, the blues is returning to the most famous club in the world. Back in March 1957, American Blues legend Big Bill Broonzy performed at the Cavern Club as part of his European tour. He was the first of a succession of legendary blues artists to perform at the club, which included Sister Rosetta Tharpe, Marie Knight, Sonny Terry and Brownie McGhee and many others. Four bands have been chosen to compete in the contest on September 10, organised by the UK Blues Federation, after a panel of 250 people from across the country were invited to nominate the acts they wanted to represent the UK at the European and International Blues Challenges. Elles Bailey – a Bristol-based blues and roots singer/songwriter, the 28-year-old is known for her ‘smoky vocals’. She has appeared on festival line-ups with acts including Lisa Simone and Wilko Johnson, and is releasing her first album this autumn 2017. LaVendore Rogue – described as one of the most exciting bands to emerge on the UK Roots scene for many years, the group features JoJo Burgess on vocals, Joel Fisk on guitar, Stephen ‘Cupsey’ Cutmore on drums, Rob ‘Tank’ Barry on bass and keyboardist Warren Lynn. They have just released their first live album, A Night in the North. Rainbreakers – the four-piece from Shrewsbury has been hailed as one of the freshest new sounds on the UK blues rock and soul circuit, and members are particularly influenced by ‘sounds of the past’, from soul melodies to garage-rock riffs. The band has won a place on the main stage at this year’s Great British Rock and Blues Festival. Zoe Schwarz Blue Commotion – Schwarz’s yearning vocal style is blended with guitarist Rob Koral’s ability to come up with catchy riffs and musical arrangements that keep the blues looking in to the future. The band also features Pete Whittaker on Hammond organ and Paul Robinson on drums. Its latest album, This Is the Life I Choose, was released in March. The fifth and final act will be a young band chosen by representatives of Jessica Foxley Unsigned at the Great British Rhythm and Blues Festival at Colne in late August. Each act will perform in front of a panel of judges, and will be marked in five categories – blues content, vocal talent, instrumental talent, originality and stage presence. UK Blues Federation chairman Ashwyn Smyth said: “After the success of this year, the UK winning the European Blues Challenge with the Kaz Hawkins Band, the successful act from the UK Blues Challenge has quite a task! “We’re very pleased with the great variety represented by the four bands already selected, and believe this demonstrates what a broad church the blues in the UK is. “Originality and variety counts for a great deal and to win, bands have to have that special something. I believe our chosen contestants all demonstrate this in buckets. The winner will be invited to represent the UK at The European & International Blues Challenges in 2018. The UK Blues Federation (UKBlues), is a pan-UK Federation that has been established to promote and support Blues in and from the United Kingdom in all its forms and styles. We have created a not for profit federation of musicians, organisations, associations, groups, venues, companies, individuals and any other interested parties within the UK who already work to support, promote and encourage blues of all sorts within the UK, to work together to achieve UKBlues‘ aims.